Thank you for reading and relying on host.madison.com for your news and information. You have now viewed your 30-day allowance of FREE pages. Want to read more? Thanks for being a frequent visitor to host.madison.com . You have now viewed of your FREE premium pages this 30-day period. After you have viewed FREE pages, we will ask you to purchase a subscription. For only $4.95/month, you get unlimited access to premium content across all of madison.com including the latest news, sports, event listings, obituaries and more. If you're already a Wisconsin State Journal subscriber, you can get unlimited access to madison.com for $1.95/month. That includes all of our sites, not just the newspaper. Though the city's second Ride the Drive of the year won't be Downtown, the event's enthusiasts won't be denied any miles of prime, car-free peddling. Thompson Plumb Funds is changing its name to Thompson IM Funds, effective Sept. 6. Madison was ranked No. 1 by Kiplinger’s Personal Finance today on a new list of the Top 5 best cities for young adults. Stem cell pioneer James Thomson, others help advance science and the regional economy. Marjorie King is a clay artist who owns her own studio near Mount Horeb. 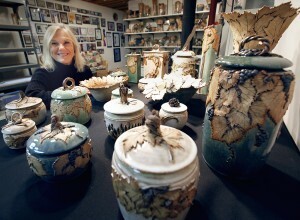 She makes cremation urns, bowls, plates, platters and other pieces. I make pottery cremation urns for pet and human ashes. I'm currently working on an urn that will hold the cremains of the both the pet and the owner. When a client calls to order a pet urn, I talk with them to learn more about what the pet liked to do and then include that in my design. I dream the design and often wake up in the middle of the night to draw the design in my sketch book. As a clay artist, I make pottery that reflects the earth and nature. Clay is from the earth and I enjoy making my work reflect things that are found in nature. William Shakespeare wrote, "One touch of nature makes the whole world kin," and I relate with that statement through my work. I also make bowls, plates, platters and many other pieces from clay. My work is both decorative and functional as I developed my own glazes, which contain no chemicals that could leach into food. My glazes reflect the Earth: the soft green of southwest pines; the blue hues of the sky; the speckled cream of wheat fields and the browns of dried autumn leaves. My pieces are wheel-thrown and decorated with hand-built additions in kiln-fired clay made from leaves sculpted into clay using a 14-step proprietary process developed over 35 years. My unique pieces feature leaves and nuts from oak, maple, walnut, elm, ginkgo and grape leaves and vines. It takes 15,000 to 50,000 hand strokes to finish the leaves on the pieces. The work can only be made during the seasons when the leaves have the correct water content and texture to harvest, so quantities are limited. I took an interest in making pottery after I graduated from UW-Milwaukee with associate degrees in social work and music. I wanted to continue to learn new things, so I took classes in various subjects including Japanese cooking, quilting and pottery. After my first pottery class 40 years ago, I came home and told my husband this was what I wanted to do for the rest of my life. I was invited to sell my pottery at an art show and sold out before noon. I did 30 shows that year and shops began to call to ask to sell my work. My work is currently in 21 countries and 27 states. What I Do features area residents who have interesting or unique jobs. The column runs every Tuesday. To suggest someone to feature, contact Jill Carlson at jillcarlson1957@gmail.com with the name, contact information and a brief description of what the person does. Copyright 2012 madison.com. All rights reserved. This material may not be published, broadcast, rewritten or redistributed. 50th Anniversary Specials All Summer! Wheat Straw; Corn Stalks; Big Square Bales (3x3x8) For Sale. Call Mike 920-296-2662. What's your favorite event at the Summer Olympics? Enter the Backyard BBQ Sweep Steaks to win the perfect summer package! TENNIS --husband and wife duo "embrace broader pop sensibilities"
MINDY SMITH --"a powerful punch of pop with pure expression"
MILO GREENE --"Folk-rock alchemy adds up to one impressive debut"
EVE TO ADAM --"the anthemic, guitar driven rock band"
Jerry's Hot Picks MULLIGAN MATCH-UP --Your shot at $250 or a free foursome! Win free movie tickets and stay on top of Madison's movie scene! Use your existing host.madison.com account or a previously connected Facebook account.